If those pictures with the inverse silhouettes of the old and young women blew your mind, you might want to look away. 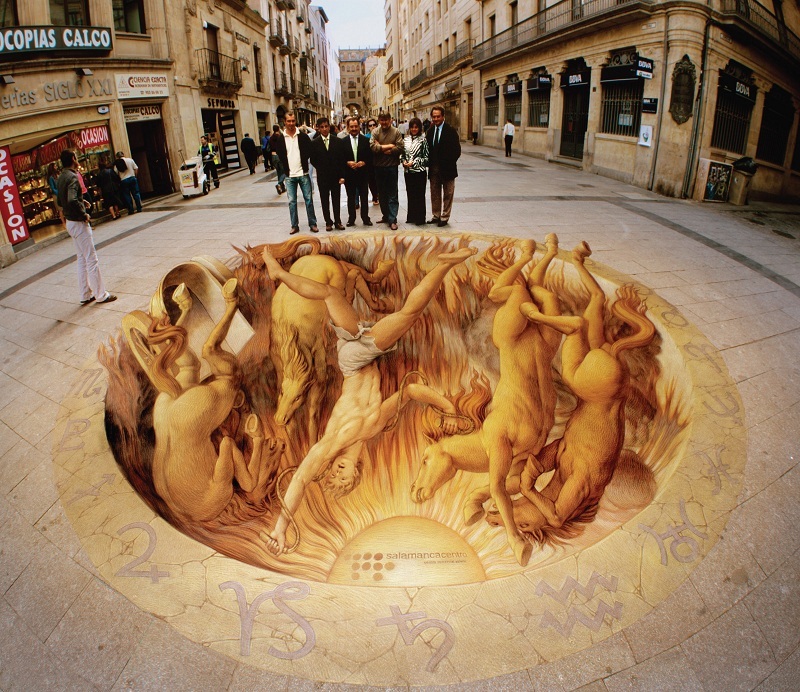 Kurt Wenner has been painting street art optical illusions since 1982, and no one does it better — which makes sense, considering he developed the math behind the perspective himself. 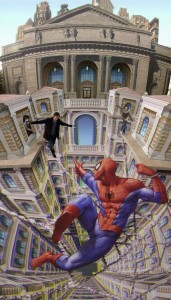 His masterpieces pose pedestrians flying on magic carpets and traversing hot lava. He talked to Sunrise Artists about painting for tips in Italy, working on commission internationally, and what he’s working on next. Your 3D pavement art is dependent on geometry and looks very different depending on where the viewer stands. Can you explain how you developed the calculations behind the “hyperbolic perspective” technique? Perspective is not always illusion; in fact, it is mostly just a method of organizing pictorial space. Only when the spectator stands at the point from which the perspective is calculated do the painted forms replace the dimensional forms that they represent. The human eye is curved, unlike a camera back. 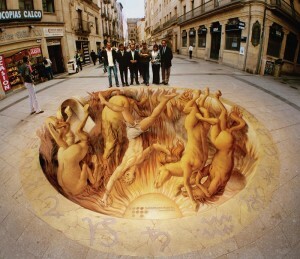 Therefore the projection from a planar surface, such as the pavement into the eye, results in curvilinear perspective. 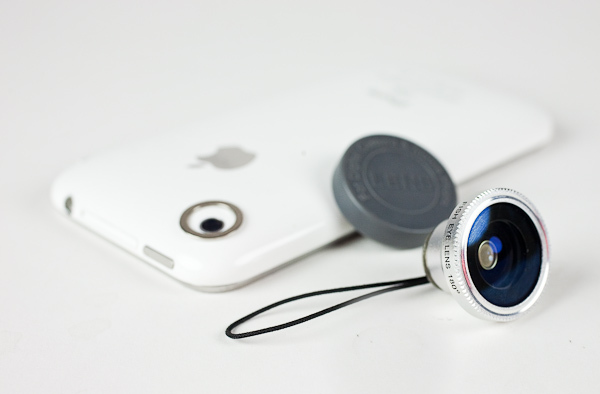 There is actually no fish-eye distortion in the eye because the distortion of a fish-eye lens occurs only when the hemispherical image is flattened onto a plane. The outward projection of the curvilinear images from the back of the eye onto a flat surface results in a hyperbolic perspective. This can be demonstrated mathematically. In the National Geographic documentary about your work, we learn that you were able to finance your life, work and studies in Europe through your street paintings. How viable is a purely street career as an artist today? How does location (Europe, North America, Asia) affect this? 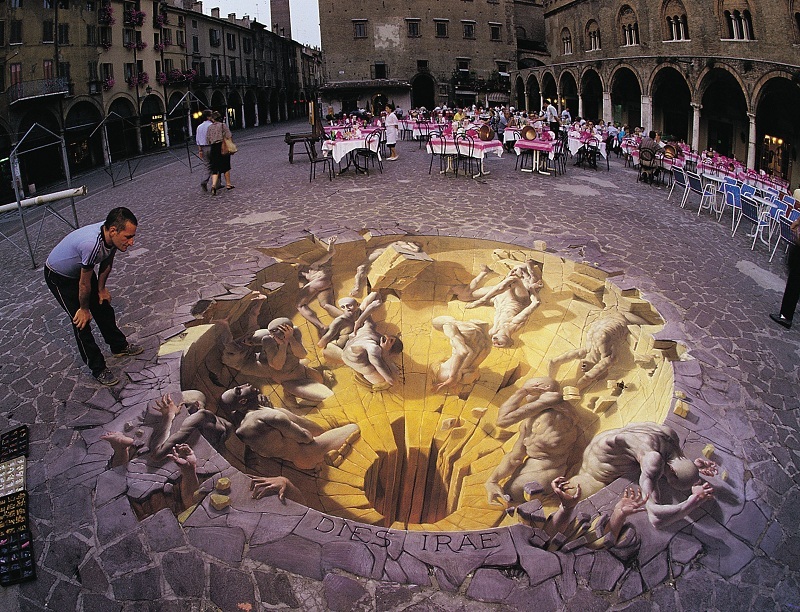 I believe it is still viable, although the venue has changed from the 1980’s when I started street painting in Rome. Pavement artists depend on fairly intense foot traffic and on the fact that the public has a little time to engage themselves in the work. Today it might be necessary in some parts of the world for an artist to make a presentation to a shopping center, for instance. This is because foot traffic on public streets is ever-diminishing. It must be said, however, that it was fairly rough going at the time to pursue this art form, and in some ways it would be easier to do it now. How does your portfolio break down between pavement art, interior design, architecture, and fine art now that you do commercial work? 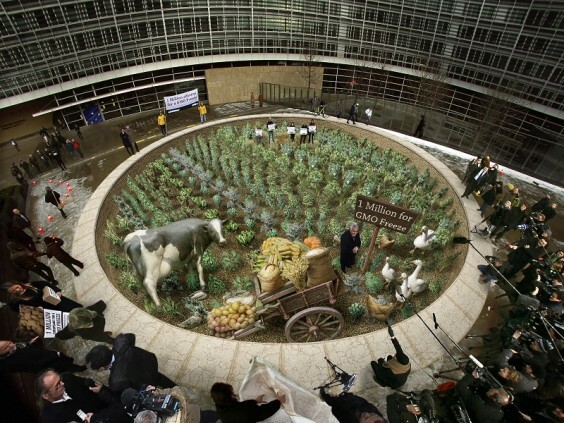 The pavement art for commercial clients is extremely lucrative. It has given the art form the dignity of a profession. All of the work I have done has been in the spirit of inquiry. I want to find out what it is like to do a certain kind of work, or solve a certain problem. At this moment I am working on creating educational programs, lectures and demonstrations. The commercial work finances these venues, but it is also difficult to leave it entirely for venues that are less lucrative in the interim. When brands/patrons started approaching you for commercial work, did one stand out as your “big break”? Do you think artists need that kind of defining opportunity for their work to develop a patronage? 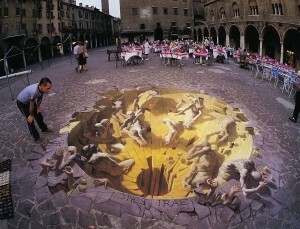 Absolut Vodka was the first client to create a campaign based on my pavement art. It was extremely successful and way ahead of its time, and probably five years before the next real advertising projects began. It ultimately depended on the development of social networking and the Internet to make pavement art a viable commercial medium. The Absolut campaign anticipated this trend. I started getting requests from corporate clients fairly late in my career, after having done many years of architectural design and decoration for large homes. Clients and patrons are different in nature. Clients want a service, while patrons seek to help an artist in his or her career and development. The contemporary world has many clients and few patrons. Because your works are so expansive, they require multiple artists to complete. How do you choose your teams? I actually create almost all of the images myself from start to finish. This distinguishes my work from others, as it can have a level of complexity that would be hard to achieve with a group of artists. I have also directed up to thirty artists on a single project, but the work must be designed in order to accommodate their separate abilities and temperaments. What have you learned from experience about communicating a vision into words and leading artists on a project — especially when working for an expectant client? It is vital that the client has a precise understanding of the design. For this reason I do not offer sketches to clients, but only very refined tonal drawings. The client must be comfortable with the design before the project begins. An important aspect of my service is also the creative verbal description, which forms part of the legal contract. Writing an impelling verbal description is an ability that is necessary for the business part of the contract. Because your works are so large and temporary, your patronage differs from that of the visual artist whose work can easily be bought and sold. What have you found to be the best method for reaching your patrons and producing enough work to be profitable in this medium? I have always worked on commission, and the difference between pavement art and doing art for a grand residence is minimal. In either case, the work is consigned upon completion, and the only thing that remains for me is a photograph. In a gallery, the works are created, framed and displayed until their sale. This gives a feeling of continuity and achievement to the artist, who can enjoy them for a while before they are bought. Financially, doing works on commission is more efficient for both the artist and patron. Today the Internet is the greatest way to contact clients and it is remarkably effective. It tends to deny artists the ability to propose unusual works, preferring artists that offer useful services. Viewing an image on the Internet is different from experiencing a work of art in person. Art that lends itself to display on the Internet always has an advantage. This has a great effect on global visual culture. You are a big proponent for art education. For aspiring and emerging artists with diverse interests, do you recommend mastering one skill at a time or trying many techniques to enhance their versatility? What I recommend is to develop creative skills. Creativity is not defined well in our time. It is the ability to manifest an idea in the physical world. For human beings, creativity is expressed in terms of language, visual, musical, or literary. All forms of creativity are “linguistic”, in the sense that human ideas enter the physical world through language. Therefore drawing is the most essential form of visual art, because it is a language of form. It is not generally taught this way, so there is often difficulty in apprehending the significance of this information. Reflecting on your time at NASA, what advice can you give to someone who is working an art-related profession but hoping to pursue a deeper artistic passion? I have consistently been rewarded for pursuing the most outrageous artistic venues, and consistently been punished for trying to “play it safe”. It might be just chance, and certainly is not common sense, but this has been my experience and it would be dishonest to deny it. I have never really learnt from the experience, and I still feel a great deal of trepidation when I need to make a significant life change. I know that changes do not get easier when you get older, therefore, if it must be done, my advice is to do it now. Where might we see your next pavement project? I have projects underway for Chile, Singapore, and some venues on the east coast, (USA). The natures of the contracts are such that I cannot reveal the information until the clients announce them. One Comment on "Kurt Wenner Interview"